Where Are the Chinese People's Liberation Army's Guided Bombs? Why the PLA still lacks widespread deployment of guided direct attack munitions. Chinese air-to-ground capabilities have experienced a significant leap in quality and quantity since the late 1990s. The People’s Liberation Army Air Force (PLAAF) and People’s Liberation Army Navy Air Force (PLANAF) strike aircraft of that era had mostly consisted of light, short-ranged Q-5 attack aircraft and aged H-6 bombers, with limited precision strike and stand-off strike capabilities. Today, the fleet consists of a large number of new H-6K cruise missile carriers and hundreds of JH-7/A and multirole strike capable Flankers. These new platforms offer substantially greater range, speed, payload capacity, as well as greater complexity of payload with the ability to deploy guided stand-off weapons (SOWs) and precision guided direct attack munitions (DAMs). However, despite these advances in the PLA’s strike platforms, observers may note how the PLA appears to lack widespread deployment of any single DAM family, similar to the U.S. military’s Paveway or JDAM family. This piece will examine the PLA’s current air-to-ground strike fleet and the weapons they field, and develop a rationale to explain the current lack of DAMs in service compared to other leading air forces in the world. Today, the bulk of the PLAAF and PLANAF’s modern strike capability can be divided into the strategic bomber category and the strike capable fighter category. The PLA fields under 200 H-6 family bombers between the PLAAF and PLANAF, of which around 90 are the newest H-6K variant in service with the PLAAF. The H-6K is a subsonic theater bomber with an estimated combat radius of over 3,000 kilometers, each of which can carry six KD-20 long-range air-launched cruise missiles (ALCMs). Other older H-6 variants have also been upgraded to carry a small number of stand-off air-to-ground or air-to-surface weapons, but suffer from older, less efficient engines. A combination of over 240 JH-7/A strike fighters, 100 Su-30MKK/MK2 multirole strike capable Flankers, and a burgeoning fleet of under 100 J-16 multirole strike capable Flankers, provide the bulk of the PLAAF and PLANAF’s strike fighter fleet, and are all capable of fielding precision guided weapons as part of their regular weapons suite, with a payload of about 8 or more tons. Additionally, about 400 J-10 variants are in service, of which at least some have been observed carrying air-to-ground laser guided bombs and anti-radiation missiles, suggesting these aircraft have been integrated with a secondary air-to-ground role. 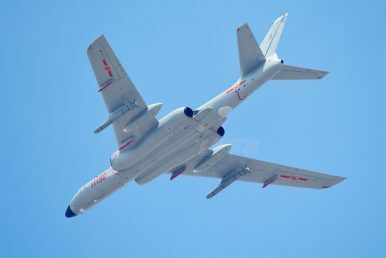 For a number of years now, JH-7/As and J-10 variants have been observed carrying targeting pods (designation K/JDC01/A) and 500 kilogram bombs identified as LT-2, and an improved variant with a different seeker. The LT-2 is an unpowered, laser guided bomb (LGB) similar to the U.S. GBU-16 Paveway II. However, the LT-2 appears to be the only DAM that the PLA fields in any meaningful capacity, despite the many different families of other guided DAMs such as the LS family, FT family, and other bombs in the LT family. Guidance of these DAM families includes satellite guidance, laser guidance, electro-optic guidance, with many featuring add-on wing kits to enhance their range. These bombs have been offered for export, with evidence that many types have undergone testing, and some subtypes have earned overseas orders as well. However, the LT-2 LGB is not the predominant weapon of choice for the PLA’s mainstay JH-7/A strike fleet; that distinction goes to the KD-88, which is a powered ALCM boasting a range in excess of 180 km. The KD-88 features different guidance modes, including TV, imaging infrared, and anti-radiation, among others. The KD-88 is easily the most photographed weapon that JH-7/As are observed to carry, and the new J-16 multirole strike capable Flanker has also been integrated with KD-88s. The KD-20 air launched cruise missile also makes up a large part of the PLA’s present strike capability. Currently only deployed from H-6Ks and some upgraded H-6M variants, the KD-20 offers a heavy air-to-ground strike capability with a range thought to be in excess of 1,500 km. Both the KD-88 and KD-20 are powered weapons equipped with an engine, and both are considered to be “stand-off” weapons capable of being deployed beyond the range of traditional ground based air defenses. The PLA’s Su-30 family have been observed carrying a number of imported Russian munitions, some of which are DAMs such as KAB-500 and KAB-1500. The J-16 has also been observed with a number of new DAMs including a suspected guided cluster bomb and a stealthy glide bomb that may be similar to the U.S. JSOW in concept. The J-16 has also been photographed testing at least one new EO targeting pod, whose function would likely be tied to deploying DAMs rather than stand-off ranged weapons. However, it is undeniable that as of 2018, the PLA does not field a widespread DAM capability among its air-to-ground strike fleet. To understand the PLA’s current preference for SOWs over DAMs, one must consider the different mission profiles each type is used for. DAMs are unpowered, guided weapons that lack onboard propulsion systems, significantly reducing their effective deployment range compared to powered SOWs. DAMs generally have a larger explosive payload than their equivalent SOWs of equivalent weight, as the lack of an onboard propulsion system allows for greater mass for the payload. Indeed, many DAMs are developed as add on guidance kits for unguided dumb bombs. Examples of DAMs in U.S. and NATO service include the Paveway, JDAM, and SDB families. Chinese DAM families include the FT, LT, and LS types, but as aforementioned, none of these have been adopted by the PLA on any sort of wide scale. The smaller relative size of DAMs enables a larger number to be carried by an aircraft compared to powered SOWs. The shorter range of DAMs means they are appropriate for close air support (CAS). However it should be noted that some powered weapons like Brimstone, AASM, and Maverick are powered weapons with effective ranges closer to DAMs rather than larger powered SOWs. DAMs can also be used in air interdiction against high-value targets if the environment presents itself. However, regardless of whether DAMs are used in the CAS role or air interdiction role, it must be preceded by attaining air superiority, preferably with sufficient suppression of the opponent’s ground based air defenses. This can be observed in the strike campaigns conducted by U.S. and NATO air forces in operations over the Middle East. Operations over Iraq and Afghanistan largely utilized DAMs, as they could be freely deployed in absence of any meaningful opposing air force or ground based air defenses that could threaten strike aircraft. On the other hand, operations over Libya began with the widespread dismantlement of the nation’s air force and air defenses by SOWs, cruise missiles, and jammers, prior to the use of DAMs. Alternatively, DAMs can be deployed by a platform that can survive and evade the opponent’s air forces and air defenses, like stealth aircraft. By contrast, most large SOWs have onboard propulsion systems that can greatly extend their range beyond the reach of opposing air defenses, and provide greater flexibility and survivability against opposing combat air patrols. Therefore, SOWs can be conceptualized as strike weapons that can be used even if an adversary has a broadly operational air force and air defense system. However, SOWs are more expensive, and tend to field smaller payloads than equivalent weight DAM counterparts. The long range of SOWs also make them unsuitable for CAS, and they are often instead predominantly fielded in an air interdiction role against fixed or semi-mobile targets that includes, but is not limited to, air fields and aircraft, bases, and ports, radars, and command and control centers. What of the PLA’s Future Guided Bombs? Until recently, the PLA clearly lacked the ability to achieve full air superiority against its potential adversaries, ranging from regional air forces like those of Taiwan, Japan, and India to vastly more capable foes like U.S. Pacific forces. Therefore, the emphasis on acquiring widespread stand-off capabilities rather than fielding DAMs was an entirely logical procurement choice. It would not be an exaggeration to suggest that acquiring a DAM capability prior to achieving the capability needed to achieve air superiority would be placing the cart before the horse. This is not to say the PLA will not one day procure a more widespread DAM capability. For example, if the PLA was forced to one day wage a conflict against a low-capability foe that lacked any air force or air defenses, it is likely the PLA would rapidly induct a DAM and CAS capability for part of its strike fleet. Similarly, as the PLA’s ability to achieve air superiority further develops, it may also become cost effective to procure DAMs for certain mission profiles, in addition to continuing to field a large number of SOWs for other mission profiles. Finally, the induction of stealth aircraft like the J-20 fighter and the expected H-20 bomber will also provide more survivable platforms that can field DAMs against opponents with intact or semi-intact air patrols and defenses. However, going forward, it is likely that the PLA will continue to field SOWs as the mainstay of their air-to-ground strike capability, even though the technology for a widespread DAM capability is easily within their grasp. The PLA’s SOW capabilities will likely further advance as new technologies mature, with stealthy cruise missiles and more advanced guidance systems expected to emerge in the coming years. Rick Joe is a longtime follower of Chinese military developments, with a focus on air and naval platforms.